Best New Poets is an annual anthology of fifty poems from emerging writers. The anthology takes nominations from literary magazines in the United States and Canada, graduate-level writing programs in the United States and Canada, and entries from an annual open competition. For more information about the Best New Poets anthology and eligibility, visit bestnewpoets.org. MARINA CARREIRA is a Luso-American writer from the Ironbound area of Newark, NJ. She holds a MFA in Creative Writing from Rutgers University. Her work is featured or forthcoming in The Acentos Review, The Writing Disorder, Naugatuck River Review, Writers of the Portuguese Diaspora: An Anthology (Boavista Press, 2015), Bluestockings Magazine, THE FEM, Rock&Sling, Paterson Literary Review, Paper Nautilus, Pif Magazine, and All We Can Hold: A Collection of Poetry on Motherhood (Sage Hill Press, 2016). “Morning Song” was published in issue #20, Trigger Warning. and how to spit seeds across the expanse of the lawn. but you offer forgiveness anyways. thing he has ever seen. at the tip of your tongue. IMAANI CAIN was born in San Diego, California but grew up in New England. Currently, she lives in Boston with a shaky bookshelf that is crowded with far too many novels. She is an editorial assistant for Talking Writing Magazine and has been published on both Thought Catalog and www.Exsistentia.net. In her spare time, she studies French and paints watercolors. “The Prologue” was published in issue #20, Trigger Warning. Bettering American Poetry is an annual anthology of American poems which jam dominant systems of taste and resignify the very phrase “American poetry” with the languages that it so desperately lacks. This anthology centers voices of resistance, subjectivities that emerge from the radical margins, artists whose Americanness transcends nationalism and other borders, perspectives historically denied institutional backing—in short, poets and poetries that are urgent and necessary but do not get along nicely with Power. For more information about Bettering American Poetry and eligibility, visit betteringamericanpoetry.com. & look nothing alike. how hungry is always around the corner. you won’t bring home to yo mama? who you think you foolin’? every day & wake to lick the corners of your lips. SIAARA FREEMAN is your friendly neighborhood hope dealer. If the something in the world saves you, you should try and save something in the world with whatever it is you got. She’s got poems. 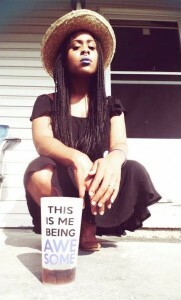 Siaara’s chapbook, Live from District 11, is available on Kindle. “A Reclaiming” was published in issue #20, Trigger Warning. what kind of trauma made you live like this? taste the same as theirs does? 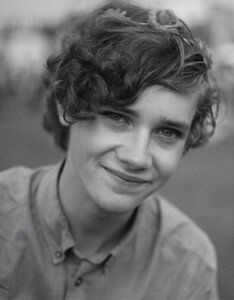 ALISON RUMFITT is an 18 year old writer who lives in the South of England. There isn’t much to do there. Writing seemed like a good option. When she isn’t doing that she’s standing around in the kitchen at parties, or running away from things, or trying to formulate a life philosophy built on chips n dips. Her poetry has previously been published in Persephone’s Daughters. “The Only Trans Girl at the Party” was published in issue #20, Trigger Warning. gold bangle sheened red on her left arm. and carry their unshed nightmares into the afterlife. come tomorrow morning, just to be sure. and give bitter thanks for it. all the ghosts to come. 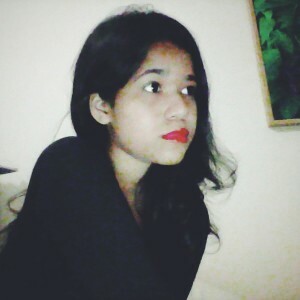 LAKSHMI MITRA is a 19-year-old college student living in Calcutta who occasionally frustrates herself into a bout of writing. When not doing so, she can be found reading, studying, craving sleep, and complaining. She is mostly polite, a lousy conversationalist, and doesn’t like sudden movements. Therefore, it comes as a great surprise to her that her cats still don’t like her. “Elegy for a Child Bride” was published in issue #20, Trigger Warning. This entry was posted in Contributor Feature, Feature and tagged A Reclaiming, Acolade, Alison Rumfitt, Award, Best New Poets, Bettering American Poetry, Elegy for a Child Bride, Imaani Cain, Lakshmi Mitra, Marina Carreira, Morning Song, Nominations, Nominee, Only Trans Girl at the Party, Siaara Freeman, The Prologue on March 12, 2017 by Raquel Thorne. Donating to their campaign has some really nice—and unique—perks! Including handwritten poems signed by the author from poets Kaveh Akbar, Heather Bell, Sarah Blake, Chen Chen, Siaara Freeman, and Megan Peak. 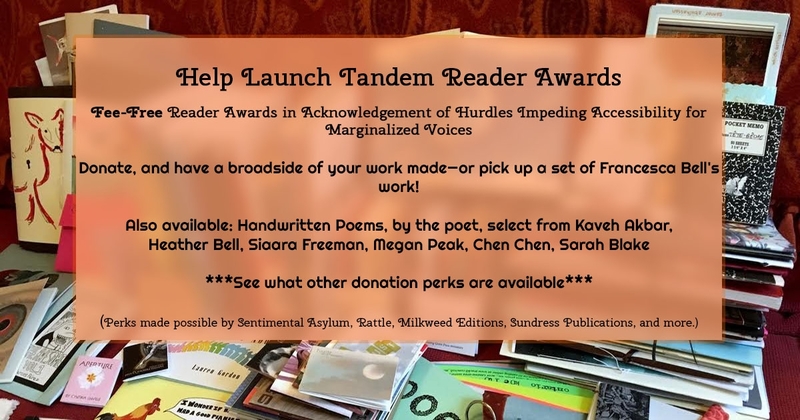 Tandem Reader Awards is a FEE-FREE post-publication award for chapbooks, where the award will be given to both the author and editor of the winning chapbook. TRA began as an idea in 2015 when we noticed a deficit of reader awards for chapbooks and a similar deficit of reader awards for editors. As we discussed these needs in our community, we realized an additional and more prevalent need in our community for more accessible awards. TRA believes it is important to acknowledge the hurdles, including submission fees, impeding accessibility to many awards in our creative community, especially for minority and marginalized voices. We asked ourselves: What if we could award the special relationship between writer and editor, while pledging our commitment to being broadly accessible within the literary community by maintaining fee-free nominations? The answer was clear: We can. These ideas work beautifully in tandem and you can help make it happen. Our goal is to raise a minimum of $2,000 to cover the initial start-up costs: A PO box for mail nominations, a checking account, promotional materials, and registering for our 501c3. Additionally your contribution will go towards the $150 prize awarded each to the editor and the author of the winning chapbook, and will guarantee the first two years of the awards. Any additional funds raised over $2,000 will sweeten the prize pot; we hope to surpass the $150 prize amount for our winners and demonstrate community support and commitment to a more inclusive writer community, where we can honor the work first and foremost. This entry was posted in Uncategorized and tagged Award, Chapbook, Chen Chen, Fee-Free, Fundraiser, Heather Bell, Kaveh Akhbar, Megan Peak, Sarah Blake, Siaara Freeman, Tandem Reader Awards on June 22, 2016 by Raquel Thorne.